ONLY 1 BAG LEFT. 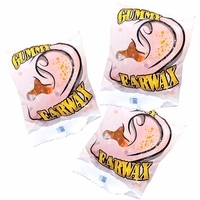 Gummy ear wax candy is especially a gross Halloween treat. Each snack size bag has has little chunks of lemon flavored gummy candy. Each bag is 1 pound and has 30 individual treat size snack packs. That's a lot of ear wax.